THEN Carte Crepes have pledged 100% of generated revenue to the creation of Australia’s first biodegradable takeaway crepe cone. University of Melbourne lecturer Dr. Ben Neville posted a comment on the Carrotmob Melbourne blog just before Easter 2011 about running a Carrotmob at Melbourne Uni. Carrotmob volunteer and Melbourne Uni student Ashlee Brady approached a range of businesses at the uni to get involved. Three businesses made commitments and Dr. Neville's Marketing and Society Class got to vote for who they thought had the best idea. Crepes a la Carte was the clear winner with 28 votes out of a total of 37! Carte Crepes co-owners Liz and Ben had already investigated making a biodegradable crepe cone so when they were approached by Ashlee about getting involved in Carrotmob they knew exactly what they wanted to do. 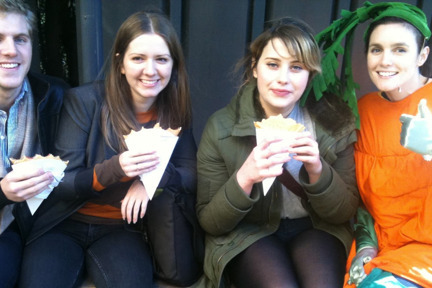 The pair have talked to a biodegradable coffee cup manufacturer about trialling the crepe cone using similar materials. “Our crepe cones are recyclable but we can’t control what happens to them after they leave the store and they don’t degrade naturally,” said Liz. Just two hours of mobbers raised over half the money needed for Crepes a la Carte to develop Australia’s first biodegradable crepe cone. Crepes a la Carte is consulting with designers and manufacturers to build the first biodegradable crepe cone for Australia! Liz and Ben hope to have the crepe cone in use by the end of the year. We’re sure there will be plenty of volunteers to test out that particular prototype!